This Psalter is named after one of its owners, John Grandisson, who was bishop of Exeter from 1327 until his death in 1369. It was adapted for his use, having originally been made for someone who perhaps lived in the area of Chichester. 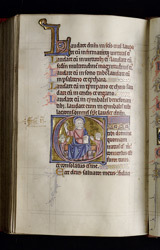 A laywoman appears in the historiated initial to Psalm 101, and she reappears in this initial (at the start of the first Canticle) with her husband: these depictions are therefore probably intended to represent the original 13th-century owner of the manuscript.